Nitrogen Triiodide is a contact explosive that is stable when wet but is extremely sensitive when dry. Touching it with a feather will cause it to blow up. How about stable-ish when wet. Anger it and it will go off even when wet. So what happens when you splash water on it? Made this in HS chemistry class. Except we set it off with air pressure, rather than a feather. 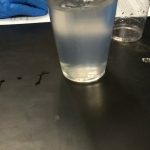 Everyone in the class made one filter paper of it, and then the teacher detonated a H2 balloon at the front of the class, and the shockwave alone detonated all the Nitrogen Triiodide in the classroom. This mp4 version is 93.14% smaller than the gif (517.64 KB vs 7.36 MB).